And …. Increased Driver Fatigue!! It is extremely important to get this right or you could suffer any one of these issues, if not multiple items. To weigh an RV is a simple thing, and very important! To know the load on each tire is the only way to be able to set the motorized RV tires at the correct tire pressure. Can you guess and get close? Yes, you can. If you know what the RV weighs empty (it comes from the manufacturer with a weight sticker), and you load it based on the weight of each item you bring on board or group of items, then you can get pretty close to the weight that is placed on each tire. But that is a pretty laborious task! Wouldn’t it be easier to take it to an appropriate facility and get it right? I can tell you from experience that when you load an RV for travel: you put all your clothes, kitchen items, cleaning items, tools, toys, etc. inside, it is entirely possible to have hundreds of more pounds of weight on one side of the RV than the other side. Is this a good idea? Well, you can as long as it does not look like it is leaning to one side. But then the most important thing to do is set the tire pressure accordingly. As much as possible it is best to balance the load! But, you can only do that once you weigh your RV! So, where can you get this done? 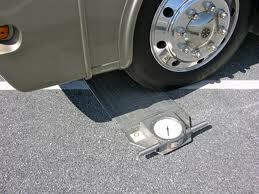 Pilot/Flying J truck stops have certified truck scales that can help to determine axle weights. Even some weigh stations along the highway are willing to help with this task. 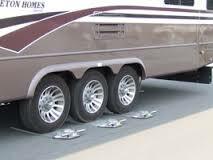 But, for an RV, given its load variations due to tanks, fuel, and owners personal possessions, it is much better to weigh each tire to determine exact loads. Once you have that information you can adjust for each RV trip thereafter. If you are riding on ST tires, tire pressure is much easier to address. They are inflated to the manufacturer’s maximum suggested pressure. But, it is still recommended that you know what load is on each of the trailer’s tires! 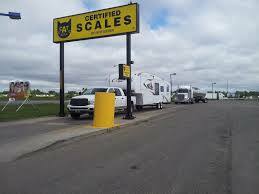 There are services that use individual tire scales that can accomplish the task of measuring the weight placed on each of an RV’s tires! They are very accurate and provide a printed weight sheet. Individual wheel weights are necessary to identify and resolve side-to-side balance and tire loading issues. Once you know these values you can set your tire pressure, for each tire, based on the load it is carrying. This is so important for traveling safely while on the road in your motorized RV! Most times I have found these folks at RV shows, RV sales and service centers, and mobile folks who just offer this service. Check locally with your RV dealer. If that does not work, do a Google search for RV tire weighing services, or something close to that phrase. You should be able to find someone near you, or perhaps near where you will be traveling to. As a side note let me add some information about the liquids onboard an RV. To help in your calculations, here are the approximate weights of the liquids RV’s can carry: water weighs 8.3 lbs/gallon, gasoline weighs 6 lbs/gallon, diesel fuel weighs 6.6 lbs/gallon, and propane weighs 4.5 lbs/gallon. These can add up fast, especially if you are traveling with a full freshwater tank: in a trailer with a 75-gallon tank, that can add 623 extra pounds. That may be needed if you are boondocking, but not if traveling from campground to campground. A quarter of a tank of fresh water will do! Okay, I think you get the idea! Howard and Pam wish you safe and joyous travels! RV Safety Tips - Consider Weighing Your RV!